Every now and then, we get a request from some club administrators asking if a member's BPay payment can be used in a different way to that which our automated payment processor decides at the time that it allocates money to debt. Now you can change that decision by taking back how that money was used, and instead re-allocating it across a member's outstanding debts in a way you see fit. One very common scenario is where a club may want money to go towards a shop order debt before a registration debt, which is not what happens by default. With great power comes great responsibility. If you decide to "unapply" somebody's payment, then all of that debt that the payment was used to pay off is now re-instated and they will appear on the Outstanding Debtors list. A general recommendation would be to only unapply a payment if you plan to re-allocate the money immediately. 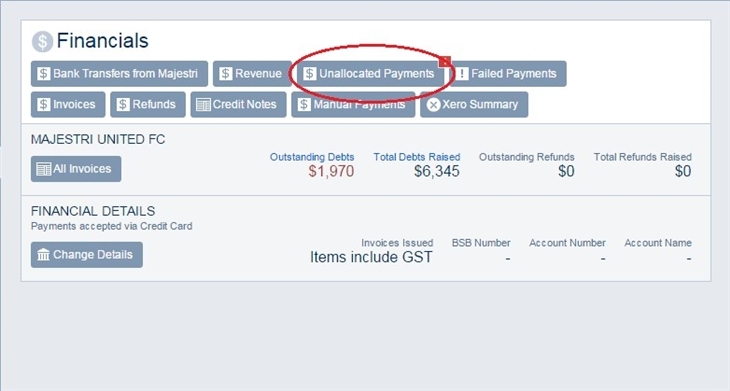 In time, there will be a number of ways to get to the central Payment Details screen, but for now you can go through the Revenue function (formerly Bank Reconciliation) and drill all the way down to a single payment. You will be in the Payment Details screen. For a given payment, you can "unapply" it when it has been fully allocated to one or more debts (ie. the "Unallocated Amount" is equal to 0). Effectively, the debts are each increased by whatever amount was being used from this payment, and the payment sits in a pending "unapplied" state until it is re-applied elsewhere. 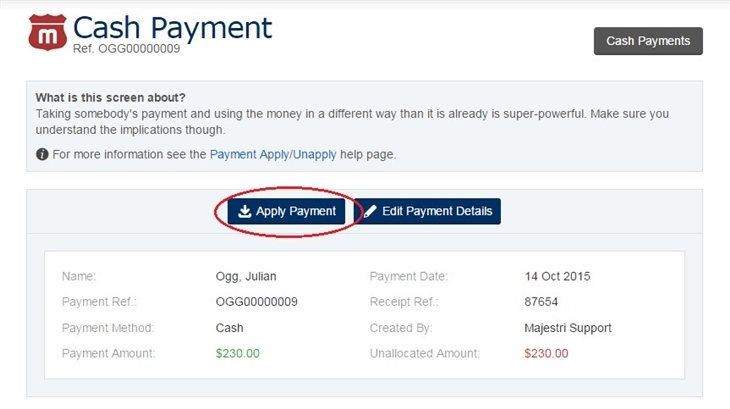 Clicking the Unapply Payment button will pop up a small window that will ask you to confirm the "Unapply". After a payment has been unapplied, it is a good idea to re-allocate that money as soon as possible. The club has seen this money from the member, so it should always be allocated to some debt that the member has raised. 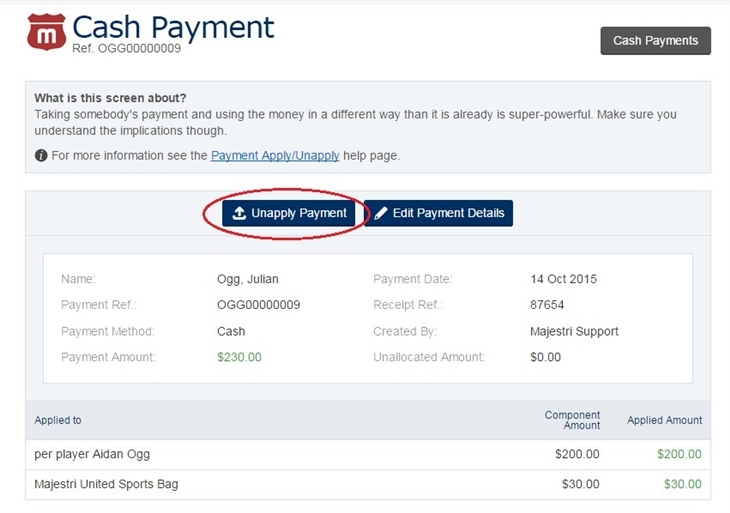 In the Payment Details screen, you will be able to apply a payment if the unallocated amount is greater than 0. This useful popup gives you the option to completely allocate the payment across all outstanding debts for that member in the system. Obviously, if the amount of debt is less than the payment, then more debt will need to be created. Naturally, it isn't always possible to re-use the payment money straight away. You may need to go away and create some more debt, and then come back to it. Luckily, the Financials tab in the Control Room has a little button (indicated below) that will show you the payments for the club that have not been allocated to debts. The little red number at the top right of the button tells you how many there are. The Apply link located to the right of each unallocated payment shows the popup screen described in the above section.